I'm glad I read the online reviews beforehand for the two pairs of shoes I purchased. Just about every review I saw suggested that the sizing of these shoes were on the small side, hence I needed to get them a size bigger than usual. Went into the Anglia Square store to purchase some sandals for myself and my daughter,I soon found some for myself but the ones my daughter liked were not available in store.The very friendly assistant Julie checked the stockroom for me,but no size 8. The other assistant,Charmagne,advised me that they could be ordered instore for click and collect and delivered to any store or to my home,which I thought was a great idea.I asked first if any other stores in Norwich might have them,and she got straight on the phone to check.Success!! The store in St Stephens has them and are keeping them for me to pick up tomorrow. 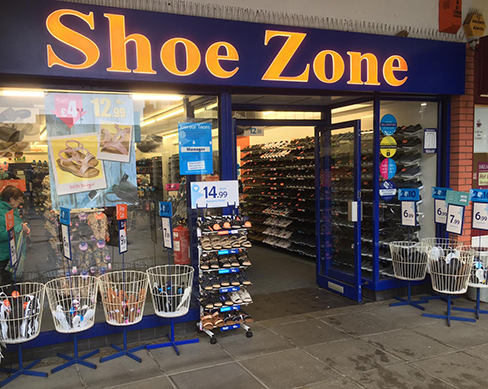 I would like to say how friendly and welcoming the assistants were and gave top customer service,they are a real asset to Shoe Zone. I was given a card for shopping online and Charmagne explained that if I saw a style online I could write the style down on the card and they could order it in for me or online.